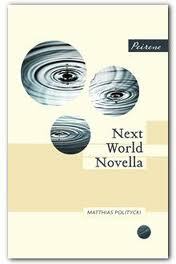 Matthias Politycki’s Next World Novella is the only second title I have read from Peirene Press (the first was Maybe This Time), and both have been strange and wonderful in equal measure, suggesting I should explore a little further. Peirene specialise in finding authors already respected in their own countries but unknown here, and then delivering them to us in beautifully produced short volumes – their books are just long enough to while away an evening. What she has been editing is not one of his scholarly papers, but a novel he began and abandoned many years before. Politycki teasingly reveals her final words before we (or Schepp) can fully understand them – as the novella progresses what we understand has to be frequently reinterpreted. However, as the story of Dana is revealed we see the remarkable parallels which Doro has alluded to. Hinrich is forced to re-evaluate his relationship with Doro. Just as Doro has discovered the manuscript, she has also discovered Dana. Doro has written her own ending to the story of Marek and Hanni, of Hinrich and Dana. More revelations follow and we are even offered alternative endings: one in which Hinrich dies and another in which they both live. It is this process that the novel sets out to describe. It is exactly the kind of book that you hope the Independent Foreign Fiction Prize will draw your attention to. Dream of Ding Village seems to be only the second of Yan Lianke’s novels to be translated into English, the first having been the earlier Serve the People. Whereas, from the title onward, Serve the People seems more in keeping with the satirical style he is associated with (it will not surprise you to learn that both novels have been banned in China), Dream of Ding Village, for all it is equally scathing in its portrayal of government both nationally and locally, is probably in that category of documentary fiction which only seems satirical because you can hardly believe that it happened. As the title suggests, Lianke tells his story – that of the spread of AIDs in rural China through blood collection – by focusing on the events in one village. 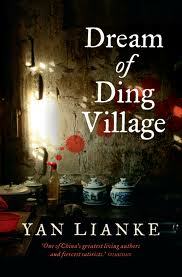 By adopting a communal narrative rather than centring the story on an individual, Lianke emphasises that this ‘plague’ destroyed communities as well as lives, while at the same time making it clear that Ding Village is simply representative of the devastation which many villages experienced. It is already clear that those who have sold their blood might be taken any day by the ‘fever’. How long they will last varies, but they will eventually die. Lianke is not interested in the tension that he might create by sketching the arrival of the ‘plague’; he is concerned with the individual stories of those who have it. As the novel progresses, we hear the tales of those who, for various reasons, chose to sell blood. This retrospective approach adds to the pathos. The common denominator is often a desperate poverty: selling blood seems an almost miraculous chance of prosperity. Thatched roofs are replaced with tiles; houses develop second storeys. Only later is the cost made plain. The narrator, his twelve-year-old son, is poisoned in revenge, and, just in case we have any doubt that Ding Hui is the villain of the piece, we are immediately told that “the day I died my dad didn’t even cry.” Ding Hui profits from the suffering of others throughout: having first become wealthy form buying and selling blood, he goes on to exploit the sale of coffins, and finally makes money out of arranging marriages between those who have died single. If Ding Hui is the villain, then the hero is his father, the narrator’s Grandpa, who apologises to the village on behalf of his son when Hui refuses. As school caretaker, he then opens the school to the sick and looks after them. A respected figure in the village at the beginning, this respect dwindles due to the behaviour of his sons. His other son, Ding Liang, is a more ambiguous character. Though frequently selfish, and characterised by his lazy grin which suggests he takes nothing seriously, he begins an affair with a married woman who, like him, has the ‘fever’. Although his father is ashamed by this behaviour, which is used to blackmail him at one point, Liang simply wants to continue living life as fully as he can, and some of the scenes between Liang and his mistress are genuinely tender, especially as they near death, though never sentimental. The only aspect of the novel I felt to be unnecessary was the conceit of the Grandpa’s dreams. Sometimes they allowed him to foresee what would happen; at other times they worked through symbolism. Generally they interrupted rather than added to the narrative which was strong enough without them. Indeed, it is the strength of the story, grounded in an appalling truth, which makes this novel so vital. But, though Ding Hui borders on caricature at times, and the ending is a little too neat, it is a story that is also skilfully told. This occurs shortly after he decides to look for Aomame, and, although Fuka-Eri suggests that his perception of the two moons is related only to writing Air Chrysalis with her, it seems also to represent his connection with the woman he has always loved but previously made no effort to locate. “What kind of reality mimics fictional creations?” Tengo asks himself, referencing his own writing. But Murakami keeps returning to the song Paper Moon, where the paper moon of the title is made real by love and belief. 1Q84 is the world where Tengo and Aomame are connected by story: in Book One this was largely structural, their two narratives running side by side; in Book Two their stories become increasingly entangled. 1Q84, therefore, is, above all, a love story, and that love becomes central to the action in Book Two. While Tengo’s narrative becomes backward looking – a visit to his dying father, a reunion with Fuka-Eri – and esoteric – an extended interlude based on a story he reads, Aomame’s takes on the tenor of a thriller as she prepares to kill the cult leader Fukado. Murakami’s ambiguous attitude towards the cult (one might say, towards everything) is demonstrated when Fukado not only confirms his more than human qualities, but also asks Aomame to kill him – he, too, is being used by the Little People and his death will leave them without a host. He also explains that, although this would mean that they would hunt her down and kill her, it would keep Tengo safe, allowing her to sacrifice herself for him. Though this physical attraction fades fro Tengo, it is noticeable how frequently Aomame, in the other narrative, refers to the smallness of her breasts, refusing to have them enlarged when she has the opportunity. When Tengo discovers an air chrysalis waiting for him on his father’s bed, it is the ten-year-old Aomame who is inside. If you’re wondering whether it all makes sense, the answer is probably that it doesn’t matter. 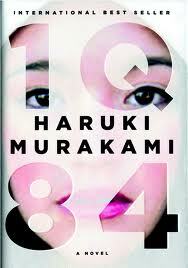 1Q84 isn’t ‘metaphorical’ or ‘symbolic’. Its over-riding concern seems to be with making a meaningful connection between two people. Both Aomame and Tengo lived in solipsistic worlds, estranged from their parents and without close friends. Most other characters in the novel are equally isolated. The cult itself is an example of retreating into a private world; as, one might argue, is the novel itself. The dynamic of the dual narrative is union, and it is the question of whether Aomame and Tengo can find each other that is the novel’s main driving force. No sooner had I thought I might dip my toe into the waters of the Best Translated Book Award (long list here), than the Independent Foreign Fiction Prize announces its own long list. To make matters worse, they only have one book in common (New Finnish Grammar), and I’ve only read two books on the Independent list (though that was one of them). Once again, I will try to read as many as I can! The success of Hans Fallada’s Alone in Berlin is a reminder that literature in translation can prove popular, even if outwith the detective genre. It shouldn’t be a surprise: Fallada was a determinedly populist writer, and his characters were deliberately ordinary. He was a writer who attempted to dramatise the pressures of everyday life, though at an admittedly extraordinary time for Germany. With Melville House having already released new translations of The Drinker, Little Man, What Now? and Wolf Among Wolves, Penguin have followed the success of Alone in Berlin with the early novel Bauern, Bonzen und Bomben, again translated by Michael Hofmann. Though the title literally means something like ‘Farmers, Politicians and Bombs’, Hofmann has opted for the more poetic A Small Circus. 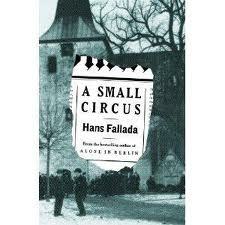 This is apt, not only because the novel begins with a circus setting up near the town of Altholm where it is set, but because the events of the novel present the political situation in Germany as a circus, with much posturing among the parties, tricks and slapstick, and an undercurrent of danger. The real circus causes offence to the local paper, The Chronicle, within the first few pages, refusing to advertise in its pages due to the fact that “No-one reads our fish-and-chip paper!” The editor, Stuff, takes his revenge by writing a poor review of the circus having never seen it. Fallada worked on such a newspaper and has a keen eye for its struggle for survival and the cynical shortcuts it takes to produce copy. Each of the local papers also has a political slant and there is much leaking of information from politician to journalist, as well as non-reporting of inconvenient stories. It is one of many areas where the novel retains a relevance to the present day. During the Weimar Republic, Germany found itself struggling economically and heavily in debt (sound familiar?) The question, then as now, is who to tax? The novel opens with a wonderful scene where two tax officials attempt to recover oxen in lieu of unpaid taxes. This time, however, the farmers are ready for them: they refuse to buy the oxen at auction and when the officials lead the animals away, they block the roads with fire. Fallada keeps a neat balance between comedy (one official is experienced and determined; the other new and naïve) and tension. The farmers’ political activism leads to a protest march through the town. The movement, however, contains agitators like Georg Henning (in the Dramatis Personae there is a section for Troublemakers); a flag he creates is objected to by the police and he is badly hurt when they try to confiscate it. As a result, the farmers decide to boycott the town. A Small Circus lacks the sympathetic characters of Alone in Berlin. Each of them – journalist, politician, farmer – is plotting or scheming in one way or another. However, they are all identifiably human: for all his satire, Fallada does not resort to stereotypes. Fallada may not be the most artful of novelists, but here is a novel which is bursting with life. You are currently browsing the 1streading's Blog blog archives for March, 2012.